(CNN) – What may be the most famous religious relic of them all, the Turin Shroud, made a rare appearance on Easter Saturday — on Italians’ TV screens. One of Benedict XVI‘s last acts as pope, according to Vatican Radio, was to authorize the broadcast of video of the shroud from Turin Cathedral, where the mysterious Christian relic is kept, out of sight, in a bulletproof, climate-controlled glass case. Some Christians believe the shroud, which appears to bear the imprint of a man’s body, to be Jesus Christ’s burial cloth. The body appears to have wounds that match those the Bible describes as having been suffered by Jesus on the cross. 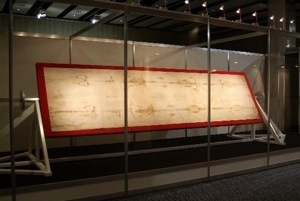 Many scholars contest the shroud’s authenticity, saying it dates to the Middle Ages, when many purported biblical relics — like splinters from Jesus’ cross — surfaced across Europe. A video message from Pope Francis was played as part of the broadcast. In it, he thanked God for the technological advances that have made it possible for the “Man of the Shroud” to be seen by, and reach out to, so many people. “This image, impressed upon the cloth, speaks to our heart,” he said. Giulio Fanti, a professor of mechanical engineering at Padua University in Italy and co-author of the book “The Mystery of the Shroud,” said the app will be “very useful” to the scientific community. “I hope the app will give us the chance of having microscopic data that will be very useful to confront different scientific research on the shroud, which, until now, is still a mystery,” he said. Fanti’s book, written with religious journalist Saverio Gaeta and published last year, spells out those findings. “We carried out three alternative dating tests on the shroud, two chemical and one mechanical, and they all gave the same result and they all traced back to the date of Jesus, with a possible margin of error of 250 years,” Fanti told CNN. Author and historian Stephen Mansfield uses the image of the Turin Shroud on the cover of his book, “Killing Jesus,” which reveals new details around the crucifixion. The new research into whether the linen cloth dates back to Jesus’ time is fascinating, he said. “My understanding is that there’s not unshakeable evidence but it’s more difficult to dismiss the shroud now,” he told CNN’s Piers Morgan. He chose to put the shroud’s image on his book cover “because it’s simply an icon of Jesus in this generation,” he said, whether its origins are proven or not. “People say, ‘that’s maybe the oldest picture of Jesus’ — they don’t think of it being something that has to be scientifically confirmed,” he added. The shroud — more than 14 feet long and 3 feet, 7 inches wide — was restored to remove a patchwork repair done by 16th century nuns after the cloth was damaged in a fire. The shroud is not scheduled to go on public view again for more than a decade, so the TV broadcast represents a rare chance for the faithful to get a glimpse of the famous relic. The idea that the Internet has become a sort of “hive mind” is certainly not new, but researchers are still figuring out how the hive mind affects how our own minds work. A study published in Science suggests that the Internet has changed how we remember facts. The study shows that the web has become a sort of external hard drive for factual information. So instead of remembering specific details, such as who directed the film Casablanca (Michael Curtiz), we remember the name of the website where we can look up that information (IMDb). “It’s not really that different from what we’ve always done,” says Betsy Sparrow, the psychologist at Columbia University who led the study. Indeed, many of our trusted Web resources are merely online versions of print references — maps and dictionaries, for example — that we used to consult. “But the Internet is more prevalent, and people are more aware that they’re using it in this way,” she says. The study authors tested this hypothesis by giving subjects a list of facts they were unlikely to know, such as “The space shuttle Columbia disintegrated during reentry over Texas in February 2003,” then had them type them into a computer. As the subjects typed in a fact, they would receive a message on the computer screen telling them that the item had been saved in one of five folders, each with a different name. When quizzed afterward, most subjects were unable to remember the details of the facts, but about 30 percent recalled the name of the folder where the information was stored. DNEWS VIDEO: IS IT FUTURE YET? “This is consistent with the long history of studies showing that people remember contextual clues that can help them remember the relevant information,” says Michael Mozer, a memory researcher at the University of Colorado, Boulder, who did not participate in the research. Only when the subjects received a message that the factoid they typed in would be erased did their performance on the memory tests improve, supporting the notion that people trust computers and the Internet to store information. “It’s clear that the Internet and computers have a lot of meaning to us,” says Gary Small, a psychiatrist at the University of California, Los Angeles, who has studied how online search affects brain activity but was not involved in the Science study. Historically, people have relied on physical hive minds made up of friends and colleagues to help them remember specific details, a phenomenon social psychologists call transactive memory. The study authors propose that the Internet now fills this role, becoming the ultimate know-it-all friend whom we can access anytime. The study also suggests that we may not be able to mull over fact-based questions without thinking of Internet search tools. In a separate experiment, the researchers followed trivia questions with an exercise called the Stroop task. The exercise presents subjects with words in colored ink and asks them to identify the color. The classic example involves color names spelled out in an ink of a different color, such as the word “green” in red ink. When asked to call out the color of the ink, people often read the word instead of identifying the color. But Sparrow and her coauthors used the test to compare computer-related words, such as “Google” and “Yahoo,” with unrelated brand names, such as Target and Nike. They found that the subjects had a more difficult time identifying the color when the words Google and Yahoo were onscreen, implying that they were somehow distracted by the terms. This effect was especially evident when the preceding trivia questions had been challenging and thus more likely to prompt an online search. It’s worth noting that all the subjects in the study were college students, which means they’ve grown up using the Internet as a resource. Still, Sparrow suspects that the results would have been similar with older adults. “The effect might be stronger in younger people, but I think people have adapted to this technology pretty quickly,” she says. There are plenty of smart phone stands available today, but how many can boast the sticky appeal of a chewed-up piece of gum? The iStuck stand certainly can, and it’s useful for propping up your mobile device as well. A creation of Fred and Friends, the iStuck Bubble Gum Phone Stand is designed to hold iPhones, Android phones and other personal devices at just the right angle for hands-free viewing of video and other content. It’s not actually gum, of course — rubber and plastic, rather — but it is self-stick and can be applied and removed again with ease. The iStuck stand measures 2.5 inches long and 1.5 inches in diameter and is available at ThinkGeek. The best part of all? It’s “sugar-free and recommended by four out of five dentists,” Fred and Friends says. Digital entertainment is on the road to becoming a fully immersive experience. Last week at the ACM CHI Conference on Human Factors in Computing Systems, Disney researchers unveiled a project called ‘Tactile Brush’ that will be used to create creepy sensations during movies. The technology makes use of phenomena that have been well established for many decades. It has long been known that if two vibrating objects are successively placed at different points on the skin, an illusion of motion can be created between the two points. Another illusion known as ‘phantom tactile sensation’ is done by placing vibrating objects at different points on the skin at the same time which creates a tactile sensation between the points. The ‘Tactile Brush’ uses both of these ideas to produce all kinds of sensations. An array of vibrating coils is placed in the user’s chair and by manipulating the intensity of vibration of different coils, the system can create sensations as powerful as a vehicle making a hard turn or as subtle as a drop of rain trickling down the skin. A study released yesterday by research firm knowDigital — based on interviews with about 30 heavy streamers in the Raleigh-Durham area who commuted a half-hour or more per day — found that listeners tend to stream Internet radio as a complement to, not a replacement for, AM/FM radio. Most report starting their listening day with terrestrial radio before switching to an Internet stream. And listeners tend to reserve Internet radio for longer drives, not five-minute trips to the dry cleaner. That would seem to corroborate a data point from an earlier Arbitron report: A whopping 89 percent of online radio listeners still used over-the-air radio. Why? “They all still wanted to be connected to locale,” knowDigital president Sam Milkman said, a need that Pandora and Howard Stern can’t satisfy. 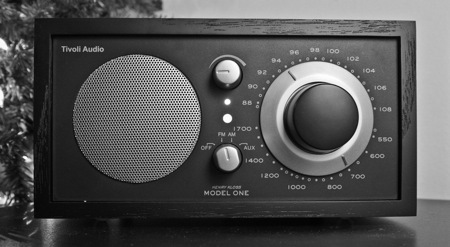 Listeners in the study reported turning to FM radio for traffic, weather, news, and morning shows — the kind of local programming that public radio stations can still deliver. Ex-NPR CEO Vivian Schiller, in her advice to stations last week, said local programming will be the strongest way to remain competitive. Photo by S. Diddy used under a Creative Commons license. Kids in Distressed Situations, Inc. (K.I.D.S. ), a global charity of leading retailers, manufacturers and licensors of children’s and youth products, launched a new and expanded website to better serve the needs of product donors, cash contributors and individuals seeking information about the 23-year-old organization. New York, NY (PRWEB) February 20, 2008 — Kids in Distressed Situations, Inc. (K.I.D.S. ), a global charity of leading retailers, manufacturers and licensors of children’s and youth products, launched a new and expanded website to better serve the needs of product donors, cash contributors and individuals seeking information about the 23-year-old organization. The site is powerful and informative and enables users to easily browse through the concise sections and pages. The site also provides accessible tools to donate products or contribute cash to our organization. "Our new website reflects the K.I.D.S. mission to improve the lives of children in distress while providing clear and direct functionality for our users," said Rick Schaub, K.I.D.S. Board Chairman. "The site is powerful and informative and enables users to easily browse through the concise sections and pages. The site also provides accessible tools to donate products or contribute cash to our organization." While retaining the address of its previous site, www.kidsdonations.org, the new site features an animated opening video explaining that "Promises Made" become "Promises Delivered" through the distribution of new clothes, books, toys and other products to children in need. K.I.D.S. distributed over $61 million worth of new products in 2007 to children and their families through a network of some 1,000 local agencies, consisting of homeless shelters, foster-care facilities, church groups, after-school programs and programs serving military families. The home page of the site shows four sections -Impact on KIDS, About K.I.D.S., How to Help, and Supporters & Partners – to which readers can go for information, ranging from descriptions of the organization’s program initiatives to lists of its product donors and local agency partners. Menu bars on the home page enable readers to go directly to a News & Events section or to access and download a product donation form or make cash donations via credit card.